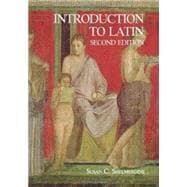 Introduction to Latin, Second Edition is an introductory Latin textbook designed with a streamlined flow that allows it to be completed in one year. Its concise and uncluttered approach gives students what they need to master the material. Grammar is integrated within the context of reading fluency. Innovative exercises provide translation practice as well as build “instinctive skills” that prepare students for reading authentic Latin works. Susan C. Shelmerdine (Ph.D. University of Michigan, Ann Arbor) is Professor in the department of Classical Studies at the University of North Carolina, Greensboro. Her research interests include Archaic Greek Literature, Homer, Mythology, Ancient Religion, and Greek and Latin Pedagogy.